Well known for its artist colony, Grand Marais, a small Minnesota town nestled on Lake Superior’s wild and scenic North Shore, has a community of restaurants and places to eat. We’ve lined up some of the best places to try. A rustic, little restaurant on the edge of Grand Marais’ harbor, The Angry Trout Café is brimming with community character. This character comes everything from its mostly locally sourced menu of organic, sustainably raised dishes to little touches inside the cozy space, like its stained glass panels crafted by local artists Sharon and Steve Frykman. The Angry Trout’s lunch menu features sandwiches, soups and salads. Meanwhile, its dinner menu offers delicious dishes full of local flavor like Lake Superior trout with a side of hand-harvested wild rice with shiitake mushrooms, peas, dried cranberries and toasted hazelnut. Located in downtown Grand Marais, The Crooked Spoon Café is an eclectic restaurant. It was opened by the husband-wife duo, Nathan and Sarah Hingos, in the summer of 2006. Nathan, who is also The Crooked Spoon’s head chef, focuses on contemporary American cuisine. He conjures seasonal menus full of Minnesota flavors with a distinct Mediterranean twist. This is evident in dishes like the house-smoked salmon rillettes appetizer with Lake Superior bluefin caviar. There’s also the braised Berkshire pork shank entrée with white cheddar polenta, spicy broccolini and a local ale jus crafted from Voyageur Brewing Company’s wares. Paintings adorn its dining room from local artists like Jan Attridge and Heidi Sobanja, adding more local character. Family-owned and operated for more than 40 years, World’s Best Donuts is a must-visit during any trip to Grand Marais. Opened by Merieta Altrichter in 1969, the place is today run by her granddaughters, Stacey and Dee. Over its long history, World’s Best Donuts has received glowing recommendations from the likes of Minnesota Monthly and The New York Times. Guests will find regular plain, sugared and cinnamon sugared donuts alongside chocolate dipped and jelly-filled varieties. There are also plenty of other treats bound to tempt a sweet tooth, from apple turnovers to vanilla Bavarian cream-filled long johns. Serving handcrafted American fare cooked up by chef-owner and Pennsylvania native Ed Straub, Harbor House Grille is one of Grand Marais’ year-round restaurants — and a popular one at that. Fresh and seasonal is the focus at Harbor House Grille. While its menu changes frequently, guests can expect dishes such as casual sandwiches and wood-fired pizzas. Also served are tempting entrées like duck confit in a cherry reduction or slow-cooked BBQ baby back ribs. Add to that indulgent, innovative desserts like crème brûlée with Minnesota maple syrup and caramelized bacon plus plenty of wine and Minnesota brewed beers. Then, you have a first-rate Grand Marais dining experience. It might be a bit of a trek out of town, but its location on the edges of the beautiful Poplar Lake just off Minnesota’s legendary Gunflint Trail makes the Trail Center Lodge worth a visit. The lodge’s on-site restaurant serves classic American fare. This includes hearty breakfasts, sandwiches and juicy burgers. Its dinner offerings feature the likes of beef tenderloin topped with creamy bleu cheese sauce and homemade Swedish meatball and pasta. There’s more to Trail Center Lodge than just its restaurant though. It’s also a gas station, gift shop, grocery store, motel and information center. This place is a vital stop-off for any adventurers exploring Minnesota’s wilds. One of Grand Marais’ livelier spots, Gun Flint Tavern hosts live music at least three times a week. As the winner of three titles in the 2015 Northern Wilds Reader’s Choice Awards (Best Music Venue, Best Ethnic Fare and Best Beer Selection), it comes highly recommended too. Choose from sandwiches, pizzas and pasta or some of that award-winning ethnic food. The menu also features Mexican-inspired fare like pork quesadilla and dishes like Nova Scotia fisherman’s stew. Be sure to try a selection or two from Gun Flint Tavern’s extensive beer list. They’ve recently introduced their very own house-made brew, the Sawtooth Mountain Pale Ale, to the list. Open since 1998, My Sister’s Place is a homey little joint that echoes its wild North Shore location throughout. This is seen from its wood-clad interior (even the bar stools are crafted from tree trunks) to the fishing nets strung from its ceiling. Traditional American fare with a twist is on the menu. Guests will find plenty of sandwiches, salads, seasonal fish and homemade pizzas. The restaurant’s real specialty, however, are its burgers. There are more than 20 to choose from, including the Goober Burger topped with peanut butter and mayo. This dish featured on an episode of the Travel Channel’s Bizarre Foods. There are also signature creations like the Blue Pig — a quarter-pounder hand-stuffed with bacon and blue cheese. Part store, part smokehouse and part deli, Dockside Fish Market has become something of a local institution since opening in 1998. Locals and tourists flock to the spot for its fresh and smoked locally caught fish. Opt for a fish ‘n’ chips basket (available with herring, cod, whitefish or walleye). Alternatively, go for a warming bowl of Dockside Fish Market’s specialty chowder. According to daily catches and availability, there are varieties like corn and shrimp, lake trout and walleye cheek. While there, check out Dockside’s local delicacies — pickled herring and Lake Superior Bluefin caviar among them — and pick up some to take home. Just a short walk from the beautiful Artists Point, Sydney’s Frozen Custard & Wood-Fired Pizza is a great spot for relaxing and refueling after exploring Grand Marais’ local sights. Choose from delicious pizzas like the Mediterranean (topped with marinated tomatoes, feta cheese, red onions and Greek olives) or BBQ chicken. Alternatively, opt for a hot dog or hearty, authentic gyro. Of course, a trip to Sydney’s wouldn’t be complete without trying its legendary sweet treats. Go for the Mint Fudge Mountain with hot fudge, Oreos and crème de menthe. Another good pick is the signature ‘sydnamis’ — custom blended concretes available in flavors like the Almond Joy with white chocolate, almonds and coconut syrup. 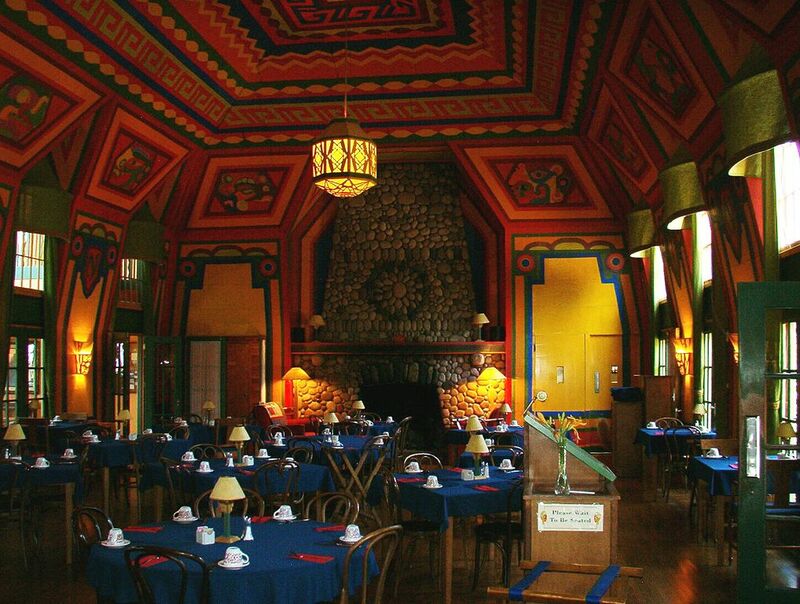 Built in 1929 and listed on the National Register of Historic Places, The Naniboujou Lodge is more than just a hotel; it’s a local historic landmark. Its dining room is the lodge’s most interesting aspect and a sight to behold. This features a 20-foot-high domed ceiling and is hand painted by French artist Antoine Goufee in a vibrant design inspired by Cree tribe art. Tear your eyes away from the restaurant’s beautifully painted walls long enough to peruse its menu. On it, you’ll find classic breakfast and brunch dishes, sandwiches and burgers offered at lunch. For dinner, there are mouthwatering entrées like grilled Alaskan salmon with a maple-garlic glaze and wild rice pilaf.